*) No information available in this part. (1) The stresses due to the internal forces and moments in a member may be assumed not to affect the design resistances of the basic components of a joint, except as specified in 6.2.1(2) and 6.2.1(3). (2) The longitudinal stress in a column should be taken into account when determining the design resistance of the column web in compression, see 6.2.6.2(2). - column web in transverse tension, see 6.2.6.3. (1) In welded connections, and in bolted connections with end-plates, the welds connecting the beam web should be designed to transfer the shear force from the connected beam to the joint, without any assistance from the welds connecting the beam flanges. (2) In bolted connections with end-plates, the design resistance of each bolt-row to combined shear and tension should be verified using the criterion given in Table 3.4, taking into account the total tensile force in the bolt, including any force due to prying action. b) (0,4/1,4) times the total design shear resistance of those bolts that are also required to resist tension. - the web of the beam satisfies the requirement given in EN 1993-1-5, section 6. (4) The design shear resistance of a joint may be derived from the distribution of internal forces within that joint, and the design resistances of its basic components to these forces, see Table 6.1. (5) In base plates if no special elements for resisting shear are provided, such as block or bar shear connectors, it should be demonstrated that either the design friction resistance of the base plate, see 6.2.2(6), or, in cases where the bolt holes are not oversized, the design shear resistance of the anchor bolts, see 6.2.2(7), is sufficient to transfer the design shear force. The design bearing resistance of the block or bar shear connectors with respect to the concrete should be checked according to EN 1992. 1c,Ed is the design value of the normal compressive force in the column. NOTE: If the column is loaded by a tensile normal force, Af,Rd = 0.
n is the number of anchor bolts in the base plate. (1) The design moment resistance of any joint may be derived from the distribution of internal forces within that joint and the design resistances of its basic components to these forces, see Table 6.1. 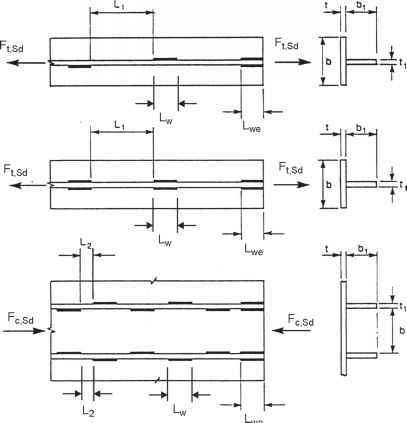 (2) Provided that the axial force 1Ed in the connected member does not exceed 5% of the design resistance iVp( Rd of its cross-section, the design moment resistance A/jRd of a beam-to column joint or beam splice may be determined using the method given in 6.2.7. (3) The design moment resistance Hj,Rd of a column base may be determined using the method given in 6.2.8. (4) In all joints, the sizes of the welds should be such that the design moment resistance of the joint Hj,Rd is always limited by the design resistance of its other basic components, and not by the design resistance of the welds. (6) In a bolted connection with more than one bolt-row in tension, as a simplification the contribution of any bolt-row may be neglected, provided that the contributions of all other bolt-rows closer to the centre of compression are also neglected. - base plate in bending under tension. (2) Methods for modelling these basic components as equivalent T-stub flanges, including the values to be used for emin, £eff and m, are given in 6.2.6. (3) The possible modes of failure of the flange of an equivalent T-stub may be assumed to be similar to those expected to occur in the basic component that it represents. (4) The total effective length X-Eeff of an equivalent T-stub, see Figure 6.2, should be such that the design resistance of its flange is equivalent to that of the basic joint component that it represents. NOTE: The effective length of an equivalent T-stub is a notional length and does not necessarily correspond to the physical length of the basic joint component that it represents. (5) The design tension resistance of a T-stub flange should be determined from Table 6.2. NOTE: Prying effects are implicitly taken into account when determining the design tension resistance according to Table 6.2. (6) In cases where prying forces may develop, see Table 6.2, the design tension resistance of a T-stub flange AT,Rd should be taken as the smallest value for the three possible failure modes 1, 2 and 3. (7) In cases where prying forces may not develop, see Table 6.2, the design tension resistance of a T-stub flange ATRd should be taken as the smallest value for the two possible failure modes 1-2 and 3.